If your little one has outgrown her crib and is a bubbly bundle of joy on your short trips, you as parents must be wondering what the next step is in this situation. As a young couple with a little one, you may be toying with the idea of going away for a short vacation or a beach trip, but worrying about how to put your toddler to sleep. Do you let them sleep in your bed at the hotel? Do you buy a sleeping bag? Do you carry an extra mattress? These questions may have popped up during planning. Well, the answer to all these questions is to pick up one of the best toddler travel beds in the market. Traveling with a young child may bring its own set of worries, but you can put them to rest along with your little one in a little travel bed. Picking a portable bed will not only ensure you sleep well, but your child will also enjoy a comfortable doze in an unfamiliar place. There are a variety of options in the market and depending on your needs; you can get a travel bed that works wonders for your toddler. We have curated a list of top 8 portable beds to help you find a comfy bed that is perfect for your precious little one. 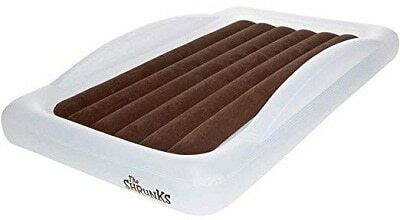 As doting parents, when you look for a travel bed for toddler that can be used both indoors and outdoors, the Shrunks Toddler Bed will suit your needs. The inflatable air mattress comes with a luxurious carry bag, repair kit which is neither too big nor too small, making it the perfect fit for your little one to fall into a dreamless sleep. This bed can be inflated using the electric pump and can be used for sleepovers, outdoor camping trips making them feel right at home. It comes with guard rails and tucks feature. It is completely air-tight and fits all standard crib size sheets. It comes with an electric pump, carrying bag and a repair kit. It does not make squeaky noises. Have to buy the pillows and bed sheets separately. The lovely guard rail feature of this product we absolutely adore! If you are traveling with your little one, this feature will gently remind them where the edge of the bed is so that they don’t roll off. It also has a ‘tuck feature’ for tucking the bed sheet in, which will ensure that your toddler enjoys blissful sleep no matter where they are. The next time you plan a family trip to visit friends or an outdoor getaway, pick up the Regalo My Cot which your kids will love. 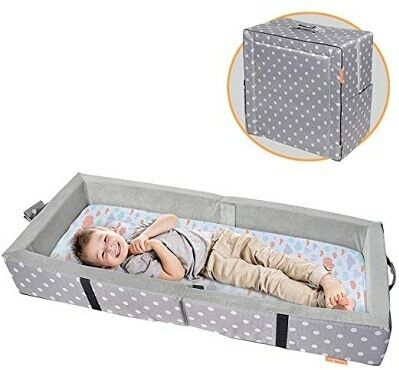 This portable bed for toddlers comes with sturdy all steel frames which can be propped up against any surface or ground. The bed can be set up with ease and can also be folded up and packed away for travel. Regalo My Cot also comes with a cotton-fitted sheet,so you do not have to worry about carrying extra sheets on a trip. The next time your kid wants to nap on a picnic or a trip, you simply have to set it up and provide a blanket and a pillow and voila! Your toddler can enjoy a comfortable nap on the go. It comes with a fitted sheet. It also has a carry bag. It cannot be machine-washed and has to be washed by hand. Not suitable for cold weathers. We love this product as it is easy to carry around on your next family outing or a visit to stay with friends. Your little angel will absolutely enjoy the crib like feeling the cot provides. The all steel frame of the cot also gives an opportunity for your little ones to sit up and watch TV without falling off. The Milliard Portable Toddler Bumper Bed is a convenient travel bed for your kid which can also be used for storing some items inside. The kids travel bed has an extra-fluffy and soft velour inside to remind your little one of the comforts of their crib while sleeping. The cover of the bed is machine washable,and it also has soft bumpers to ensure they don’t roll off onto the floor in their sleep. The custom fit sheet can be removed off the travel bed for toddler and put for machine wash. The product is also designed in such a way that is doesn’t have Sulphate, Paraben or lead keeping it an eco-friendly item. It is waterproof and washable. It comes with a custom fit sheet. It is free of toxins and chemicals. Pillows have to be purchased separately. 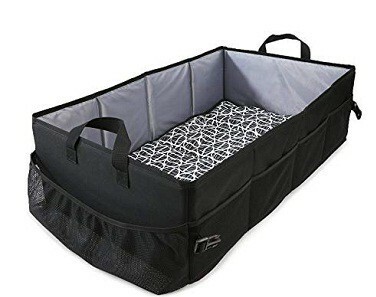 If your little one spills or drops something on the mattress, fret not, you can easily wipe it away or put in the wash, and no stains left behind making it one of the best toddler travel beds in the market. When folded, the bed also doubles up like a suitcase which can hold your baby’s favourite toy and PJs. This lovely portable kids bed is perfect for your little one while traveling. It has a sturdy frame all around which ensures that your toddler gets the best comfort and safety while sleeping. The mattress itself is soft and comes with a drawstring carry bag which is easy to carry and travel with. The sides of the toddler travel beddingalso have mesh panels which can be used to store your baby’s essentials and bed-sheets. As parents, you can provide a cozy environment for your baby’s blissful sleep.The product is also toxins free, making it a great choice for young kids. It is light-weight and portable. It has a mattress pad which is detachable. You have to buy the pillows separately. We love this product as it comes with extra pockets which you can use to store any essentials like socks or a napkin for your little one. It also has a detachable mattress pad which can be machine washed in case of any spills. Providing the most comfortable sleep for your toddler is on top of your parenting priorities, and Leachco understands this. The Leachco BumpZZZ Travel bed will provide a home away from home for your little one during their stay. The bed is extremely luxurious and can be folded and packed away easily. This makes it one of the best travel toddler beds in the market. 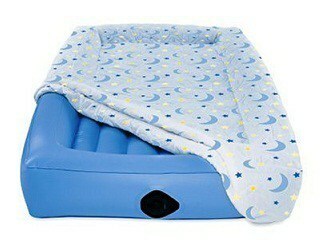 The mattress is padded in the center and has cushions all around creating a cozy environment for your child to sleep. 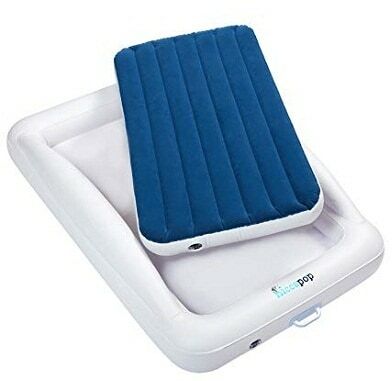 The travel bed can be easily transported as it comes with its very own travel bag. It comes with a travel bag. It has extra cushions all around to provide protection. You have to buy pillows and bed sheet separately. This bed does not need to be inflated, making it easy to fold and travel with thereby making set-up a breeze. Since your little one is also growing fast, you can continue to use this bed for a while as it can be fully extended as your baby grows older. 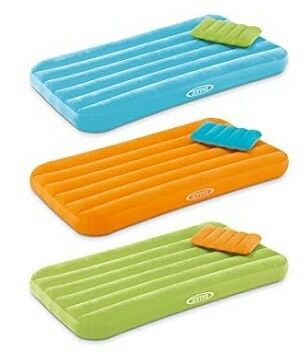 This charming inflatable bed comes in a range of bright, fun colours that you and your partner can pick from. 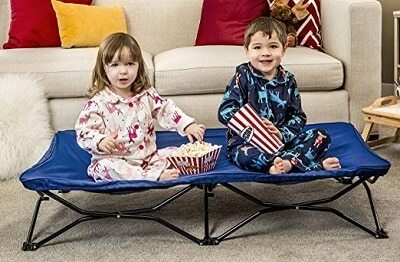 As parents when you plan for the first sleepover for your little one, you can send them off to their friend’s place with this portable bed. You do not have to give up on any comfort the next time you decide to plan a trip as this bed is light-weight and comes with an inflatable pillow as well. As this bed is waterproof, you do not have to worry about any spills staining the mattress,and it is easy to wash. It is light-weight and durable. It comes with an inflatable pillow and repair patch. It has a soft flocking for extra comfort. It comes in bright colours. You have to buy bedsheets separately. We love this product as it is a unique light-weight travel mattress with extra flocking for a comfy snooze. Your little one will get some much needed good sleep after an exciting outing. For a modern family on the go, this inflatable toddler bed by Hiccapop is a perfect companion. This travel toddler bed comes with a lifetime warranty in addition to a travel bag and an electric pump. As parents, you can enjoy seeing your little one drift off into a wonderful sleep on this bed which is protected with weld-seams to avoid any air leakage. If your toddler has outgrown his/her crib, this bed will also make for a great transitional bed before they can move onto a kid bed. The bed is also BPA and lead-free. It comes with an electric pump and travel bag. It is easy to transport. You have to buy pillows and sheets separately. We love this product as it is extremely practical and easy to set up using the electric pump. All you need to put your child to bed is a comfy blanket and a pillow. 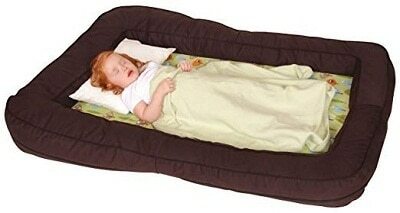 Parents will love the Aero Bed as it is completely inflatable and easy to carry around. It is a perfect accompaniment on any outdoor trips which you may undertake with your child. The mattress also comes with a thick, machine washable pad which has a lovely star and moon design on it. This is one of the best toddler bedding in the market because it is made with heavy-duty PVC, which makes it extremely durable. It comes with a hand-held AC pump. It has a surrounding safety cushion. It is BPA, Latex and Phthalate Free. We absolutely love this product as it comes with a safety cushion which will ensure your toddler doesn’t roll off the mattress during the night. It is suitable for children four years and above and can be used outdoors as well. Portable beds may seem like a luxurious add-on at first, but once your child gets comfortable in it, you will be grateful for blissful sleep and a happy baby in the morning. With this list, we have tried to give you the best options in the market to make your pick and start packing for your next getaway with a portable bed in tow!